We had the opportunity to lead a break-out session at the recent Stevenage Bioscience Catalyst (SBC) Open Innovation summit. It was a day filled with interesting presentations, panel discussions, networking and break-out sessions. Our session was one of the last in the day, so that delegates had had several opportunities to hear and reflect about the question of mindsets and the importance of soft people skills by the time they came to our break-out. Stefan Lindegaard (@lindegaard) drew our attention to this in a big way in his presentation, when he stressed some of the key characteristics for success as being a networker, communicator, intrapreneur, and an influencer. Also on his list was the ability to adapt, to tolerate uncertainty and to be an optimist. The intrapreneur was particularly important in making things happen within the company by paying attention to people and creating the right conditions for innovation. The pre-lunch panel session exploring the highs and lows of Open Innovation also homed in on the key characteristics for OI. One of the participants in our break-out pointed out that it was also a question of people’s character when we asked them what the right mindset might be. That was a great segway for our presentation, which explored two models. 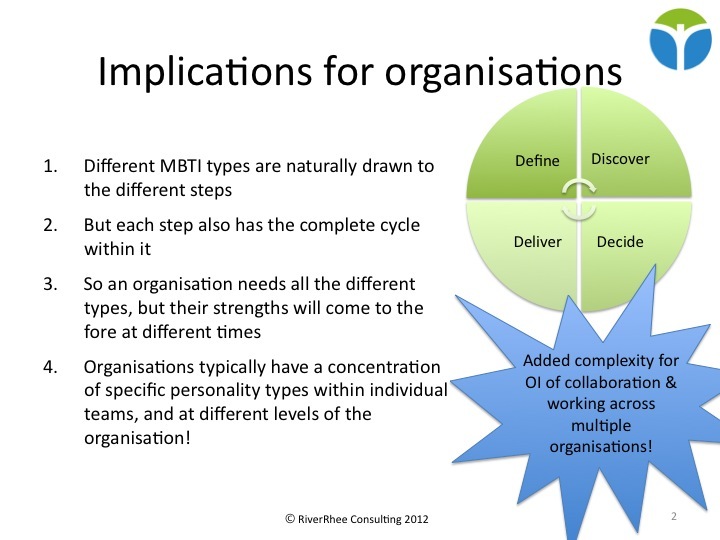 In our first model Elisabeth reflected on how some of the personality type preferences described in the Myers Briggs Type Indicator are particularly relevant to different stages of (Open) Innovation, but that an organisation needed a blend of all personality types to be successful. In our second model Lucy shared the results of her research into mindsets for innovation, and concluded that to be successful, organisations needed to seek out some unique characteristics. The break-out closed with some final thoughts from the participants, who thought passion to keep going through the ups and downs, and the ability to listen to and understand others’ language and frames of reference were key to successful collaboration in Open Innovation. Our full presentation is available on Open Innovation in Action – SBC OI summit website. Elisabeth Goodman is the Owner and Principal Consultant at RiverRhee Consulting (http://www.riverrhee.com), a consultancy that helps business teams to enhance their effectiveness for greater productivity and improved team morale. Elisabeth has 25+ years’ experience in the Pharmaceutical Industry where she has held line management and internal training and consultancy roles supporting Information Management and other business teams on a global basis. Elisabeth is accredited in Change Management, in MBTI (Myers Briggs Type Indicator) and in Lean Sigma and is a member of CILIP (Chartered Institute for Library and Information Professionals), and APM (Association for Project Management). Lucy Loh is the Owner and Principal Consultant at Lucy Loh Consulting (http://uk.linkedin.com/in/lucyloh), a consultancy that helps businesses and organisations develop their business plans, and manage change in their organisations and teams to be able to deliver those plans. She is also a RiverRhee Consulting Associate. Lucy has 25 years’ experience in BioPharma, where she has held management roles in strategy development and all aspects of performance management, as well as extensive internal consulting. Lucy has expertise and experience in organisation development, benefits management and in designing and leading business change. She is a certified Master Practitioner of NeuroLinguistic Programming (NLP), which enhances her work in change management and individual coaching. She is also an accredited trainer with the Institute of Leadership and Management for Strategic Leadership. In our August 2012 RiverRhee Consulting newsletter, my Associates and I wrote about our insights on working in virtual teams, so it was with some interest that I read about “10 rules for managing global innovation” in the October issue of Harvard Business Review (HBR)1. After all, that’s what most ‘virtual’, ‘dispersed’ or ‘far flung’ teams are aiming to do: work globally and innovate, be it to make incremental, or more large scale innovative improvements to their portfolio, whatever it might be. In this blog I’ll discuss the needs of globally dispersed innovative teams in the context of the insights in the RiverRhee newsletter and the 10 rules of the HBR article. In our newsletter we referred to the need for managers of virtual teams to have a “much broader skill set” than those managing co-located teams. They need to be able to switch between their skill-sets to support dispersed team members in different ways depending on their local characteristics. Local differences may be cultural, but it may also be a matter of the different personality mix and dynamics at each location. It’s true that dispersed teams may find it harder to stay focused on goals, tackle problems in a timely way, and make everyday decisions that enable them to maintain their momentum, without some form of more active management involvement than might be needed in a co-located team. The HBR article suggests that a senior manager should be assigned responsibility for overseeing the work of a globally dispersed team. This assumes that the team does not already have an overall manager in place and instead consists of a looser form of collaboration between the different locations. The authors also suggest that one site be appointed as the lead one. They would assist the overall manager in ensuring that a consistent bigger picture is addressed, whereas other sites might be focusing more on the detail. This site would also ensure effective decision-making and on-going progress. The HBR article suggests that a geographically dispersed team will find it harder not to drift from their remit! In our newsletter we suggested that that remit or vision should be centred on consistent communication with their customer. A team focused on innovation should definitely have a vision for what they are aiming to deliver, and with the end-customer in mind. So again, this is where a directive management approach is essential in ensuring that the team stays focused on their goal. In our newsletter, we suggested that this is where a combination of good interpersonal relationships and sound working practices will come to the fore – to address the greater diversity of a global team, and the challenges of working in a more dispersed way. The HBR article suggests that a stable organizational context (to shield the team from additional distractions) and rigorous project management (with seasoned project leaders) are additional key factors for success. The authors also suggest that starting with small cross-location projects or collaborations will also help the team to develop that strong start. Globally dispersed teams may cross organizational boundaries, for instance if they are engaged in Open Innovation, something that I’ve been learning a lot about in my work with OI Pharma Partners. Even without being engaged in the complexities of Open Innovation, globally dispersed teams are likely to have multiple partners, suppliers, sub-contractors etc. The HBR article suggests that teams deliberately limit the number of these to reduce complexity, and to use those the team knows well and are more closely located. Like us, the HBR article suggests that a team should not be over-reliant on technology for its communication, and that nothing beats initial and if possible regular face-to-face interaction to build rapport and connection within the global team. The HBR article points out that one of the benefits of using a global team is the greater opportunity to draw on the necessary expertise and capabilities at the different locations. It’s therefore important to do just that, and not get drawn in to involving people just because they are available if they are not a good fit for what the team requires. The authors also suggest deliberately overlapping areas of expertise between locations to foster interdependencies in their work, collaboration and knowledge sharing between them. Finally, we stressed the importance of all team members being engaged in sharing their expertise, strengths and insights for the benefit of the whole virtual team. We also suggested that geographically dispersed team members can each play a leadership role to benefit the rest of the team by looking for opportunities to deliver the greatest value in the application of their individual areas of expertise and strength. The reflections from the RiverRhee August 2012 newsletter, combined with the 10 rules from the HBR article seem to be a strong recipe for success! What do you think? Have we missed anything? 2. Elisabeth Goodman is the Owner and Principal Consultant at RiverRhee Consulting, a consultancy that helps business teams to enhance their effectiveness for greater productivity and improved team morale. Elisabeth has 25+ years’ experience in the Pharmaceutical Industry where she has held line management and internal training and consultancy roles supporting Information Management and other business teams on a global basis. Elisabeth is accredited in Change Management, in MBTI (Myers Briggs Type Indicator) and in Lean Sigma and is a member of CILIP (Chartered Institute for Library and Information Professionals), and APM (Association for Project Management). Meeting kicking off – looking forward to it! The meeting started with some speed networking in which I met lots of great people from all sectors of work, the UK, sizes of organisation, and levels of experience of Knowledge Management. We shared our expectations of the day, common themes being: to gain practical insights, how to use lessons learned or project reviews because people still make the same mistakes all the time, and how to measure and share knowledge. Innovation is about getting value from new ideas. Steve shared a graphic with others, which suggested an evolution of the business model from working entirely in-house to working in partnership, group collaboration and now open innovation. He suggested that the benefits and knowledge gained have gone up through this process, but that the degree of control has gone down so that we now have very difficult to manage complex projects. Anglian Water has created a Water Innovation Network with underlying process to assess and adopt new ideas. New ideas are assessed through a “Dragon’s Den” type forum and then the WIN steering group, so that they have a formal and robust process to drive new ideas into the organisation. They use an electronic “Learning Hub” to capture learnings & prompt comments and actions at the various stages of capital projects. They are trying to get people to rank and comment on learnings and so drive actions for improvement. Anglian Water’s Standard product approach captures information on a large range of features with commentary online – so that this can act as a dynamic reference source for those developing products. Steve believes that Nonaka’s tacit/explicit knowledge cycle is still relevant, for example in capturing knowledge from people who retire. They are trying 1-day master classes with video recording as way to capture knowledge from retirees although he also suggested that the solution is to re-employ them as consultants! 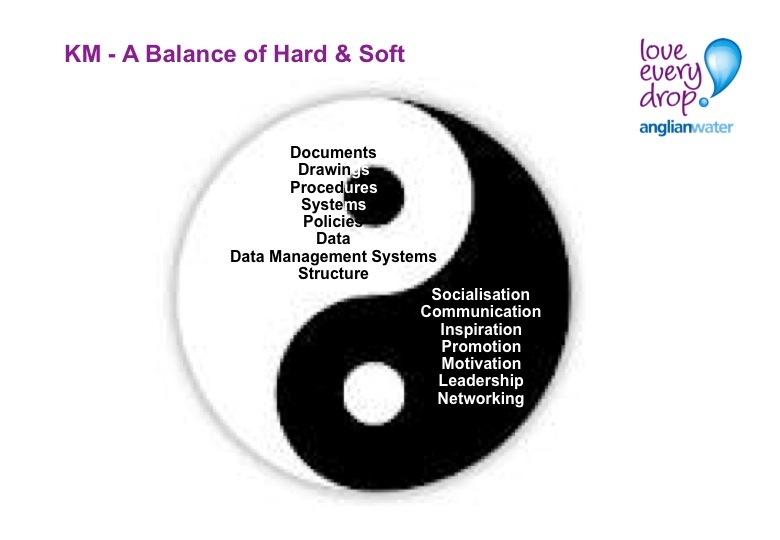 Steve concluded with a yin/yang illustration suggesting that knowledge management is a balance of hard and soft: data, documents etc. and behaviour, communication, leadership. There are challenges of consistency, duplication, operating in real time. And there are opportunities to create a knowledge sharing culture and to drive innovation. On lessons learned, Steve said that although there is a challenge to get project managers to meetings because they are very stretched. Once they do get to meetings valuable learnings are obtained. They have about 50 learning facilitators to organise the meetings and they are trained to ask the right questions. But on the whole the benefits realisation process is much more developed in Anglian Water than lessons learned. 1. How to create a culture of knowledge sharing? 2. What makes a good knowledge sharing system? Victor Newman facilitated this session using his “Smart failing” technique that we all practiced later in the session. He maintained that we need to start focusing on knowledge building, rather than knowledge sharing – something that he also described in his 2002 publication “The Knowledge Activitist’s Handbook”. 3. How can we convert tacit to explicit knowledge? Is there a corrolation between project management maturity and knowledge management? Judy reiterated that what works in one organisation for knowledge sharing will not work in another. She pointed out that army personnel are strongly motivated to learn from each other, and that just in time training with knowledge shared between people therefore works well in that environment. Judy pulled up the wikipedia definition of knowledge sharing, and referred to others, which use terms such as knowledge transfer, flow, exchange etc. Telling people something is not enough for knowledge sharing – it needs understanding, interpretation and application to really be effective. 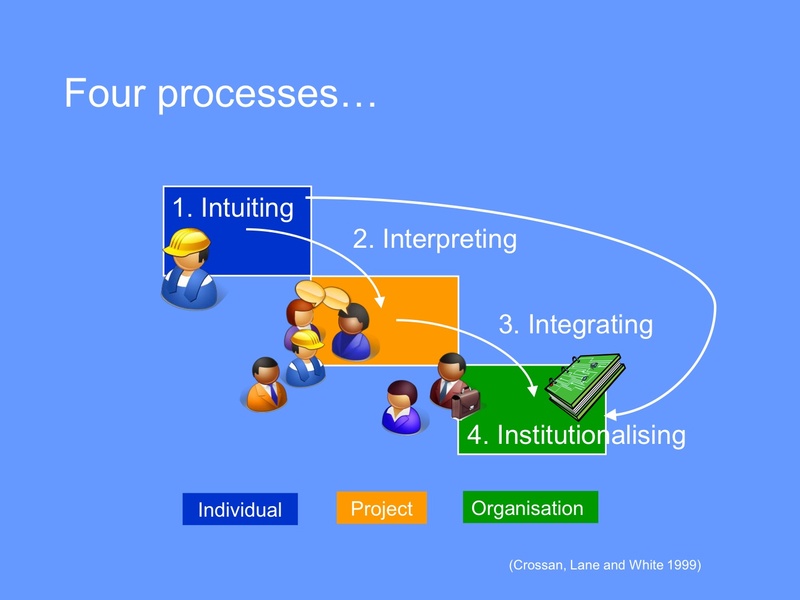 Judy thought it would be helpful to relate knowledge sharing to an organisational learning model. It needs a willingness to unlearn what we know, and is a multi-level process within an organisation. Individual intuition – where an individual realises there is something new that is important to tell others about. 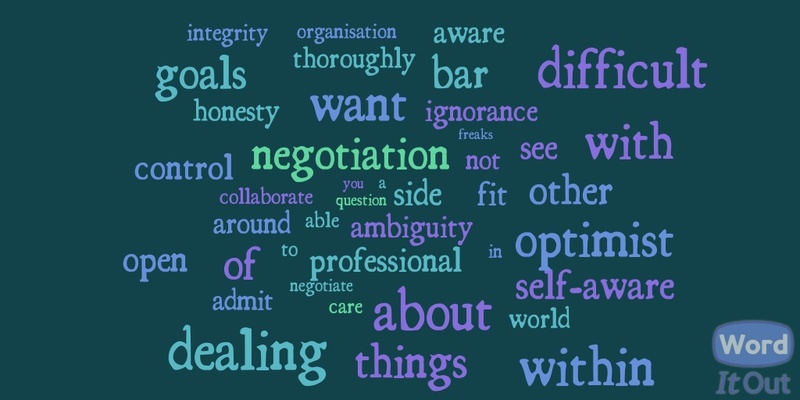 Work group interpreting – the individual discusses what s/he has learned within their work group. It’s relatively easy to do as the group has a common language. They may as a result decide that they need to take some kind of action, which may involve talking to a manager higher up the hierarchy. Organisational integration – this may be a more difficult discussion. It may require showing the more senior manager some tangible results and a more detailed description of how things work. It may require involvement of a senior manager’s peer who may have had more direct experience of what the group is trying to describe. It may result in the more senior manager thinking this is such a good idea that they adopt it as their own with / without acknowledgement of the original individual’s insights! Institutionalisation – this involves actual embedding of a new way of working with all the challenges involved in doing so. However, if successful, it can then trigger a whole new wave of unlearning required the next time a group or individual identifies a new insight. Judy thought that a model such as this might help us to understand why lessons learned approaches often don’t work! Break out session – How good are we at knowledge sharing? There is nothing like getting teams together: old with new, or concurrent; maybe bribing people with pizza! The effectiveness of getting people together one on one with no-one else listening! Fujitsu’s us of “KELs” (Knowledge Element Libraries) for IT: a Q&A system with the answers to problems that have just happened on individual’s systems. It’s a quick look-up source, is very focused and can be referred to at the point of need. Individuals are encouraged to write a KEL after every incident. Xerox’s quality improvement programme about 20 years ago where everyone was encouraged to think of better ways of doing what they did. If their manager agreed they could form and lead a team to address it, and then prepare and present the outcome directly to directors. Every team was given 15 minutes of glory to put up a stand, which the managers visited. Awards and certificates were presented. Steve described the value of running this special interest group via APM; that it can also include non-project management people and the diverse inputs that this would bring to the group. He and the other members of the committee are looking for input on the needs of a KSIG community and it would be looking to deliver potential quick wins and stimulate understanding and knowledge in this area. The next event will be on 18th July in the evening through the Leeds & York branch. A 2nd all day event is also planned for September. We need to adapt faster and facilitate people’s thinking in real time. We can’t permit drift in our work. He took us through some of his Emergent Knowledge Management techniques (EKM); these are covered in detail in his book. We began with “behavioural literacy”. We should recognised that our behaviour is a gift: what we do and how we do it, even down to what we wear and our body language carries the biggest message to the people we are interacting with. What we say is only a minor part of the total message. Behavioural Literacy is about creating personal awareness of the messages we are sending, and taking corrective or preventative measures, or actively using this behaviour. We tried this out individually on personal incidents relating to gifts we made that did not work, tackling an impossible task, undergoing a significant change etc. and shared the results. It was apparent that many of us had gained some very positive learnings in just this short time. Victor’s experience that getting people to ask themselves and articulate to others that something “made me feel” develops a ‘muscle’ of interpretation and makes others more willing to listen to what is being communicated to them. He reiterated that there are no lessons learned until you’ve changed behaviours. All else is documentation. When designing new behaviours it’s useful to identify: the current behaviour, the target behaviour, and how we will behave to get there. Giving the new behaviour a name makes the whole process even more effective. This new behaviour design can be applied to customers, self etc . Finally we looked at the use of contradiction & controversy to foster learning: how NOT to do things to work out HOW to do things. This is Victor’s “Baton passing” technique for lessons learned – we went through this very quickly using the Smart Failing process centred on exploring how to ensure innovation fails! A link to a space on the APM website will follow. All in all it was a very good meeting! Thank you to the KSIG team, and to Fujitsu for hosting the event. After an opening address by One Nucleus’s CEO, Harriet Fear, we heard a series of presentations by Damien McDevitt on GSK’s Business Development teams, Nicki Thompson on the Alternative Discovery and Development Group (for virtual and externalized drug discovery), Declan Jones on the Centre of Excellence for External Drug Discovery (Ceedd), Adrian Pritchard on Scinovo (for collaborative drug discovery and development). We also had some closing remards from Nicki Thompson, and a very brief introduction to Martino Picardo – CEO of Stevenage BioCatalyst. The evening was rounded-off by up to 2 hours of networking amongst delegates, speakers, and other members of GSK who were present for the event. As Damien McDevitt explained, with 70% of its current late stage pipeline being in-licensed, GSK’s ‘working in partnership’ model is about exploring opportunities for creative deal making with external partners. Nicki Thompson spoke about how GSK has been moving from the Pharmaceutical model of centralized control and management, heavily reliant on internal resources, to a de-centralised ‘virtualisation’ of drug discovery (and development) relying more on external resources. Declan Jones said that GSK are looking for companies with strong management teams, a leading position in a specific technology or therapeutic area based on first class science, and more! Adrian Pritchard explained how Scinovo provides scientific consulting and advisory support from early discovery research, through non-clinical, and clinical development. They have hubs of experts in Hertfordshire, UK, on the East Coast of North America, and in Shanghai, acting as account executives, scientific consultants, and outsourcing managers working with global CRO / CMO suppliers. Access to Scinovo can be via the Alternative Discovery and Development Group (e.g. the Ceedd within it), through the Stevenage Bioscience Catalyst group, or directly. All in all, an excellent opportunity to hear an update on GSK’s approach to working in partnership with external organisations, and to meet and network with others looking to participate in such partnerships. Elisabeth Goodman is Owner and Principal Consultant at RiverRhee Consulting– a Business Consultancy that helps business teams to enhance team effectiveness for greater productivity and improved team morale. She is also Co-Founder and Principal Consultant at OI Pharma Partners helping the Pharmaceutical industry, academia and the public sector use Open Innovation to accelerate drug development and leverage the power of underutilised Intellectual Property. Simon Orchard, Vice President Biotech Operations Europe, Pfizer, described applying Operational Excellence in a Biotech environment from facility and process design through to technology transfer and start-up. In the design phase a key issue was to build in flow and takt, rather than gravitate to maximising volume. The main opportunity was with simplification as the process. In the technology transfer phase a structured process was used and efforts needed to be made to avoid a moving target. Learning points were centred on building in the development of cleaning, taking time to plan including carrying out risk assessments to explore what could go wrong, and the difficulties of establishing a truly integrated cross-functional team from functional areas which were globally spread. At start-up a problem was encountered with below specification results. The team had the option of looking to increase results overall, or decrease the variation. The latter was selected and a DMAIC approach followed, involving a key decision to suspend the plant start-up, i.e. get it right from the start and resolve it while focus and resource is there (and not moved onto the next project). Daniela Jansen and Donna Wall, Waters outlined how opportunities to lean documentation, data handling, sample preparation and QC decisions can reduce laboratory lead times. The focus of their case study was to improve flow and eliminate non value adding steps through the introduction of data management in the interface between instruments and SAP/LIMS. Manual data entry was addressed resulting in a major reduction in data input time and the quality of data improved as did its security and opportunity for manipulation. The case study that Donna shared revealed how lab space had been saved. The issue of each instrument having its own PC was addressed through the introduction of acquisition servers. The lab team also analysed equipment utilisation over a 24 hour period and improved it through changing working practices. When asked if there were other aspects (other than technology) Donna said that simple things need to be done and that metrics created an awareness that made things happen quicker. Nadine DeDecker, Director Strategic Business Improvement, Jansen R&D, reminded us that the second output of our industry is knowledge, and that value stream mapping can address information creation (as well as product creation). Her case study showed how she started by addressing Phase 2 and 3 processes as the area with the most process improvement opportunities. This led to standardisation of processes and the development of a common language, collaborative working, role-based training and, process improvement. One of the biggest challenges though, is finding the best place to start. Does process excellence limit innovation? This was the title of a group discussion led by Craig Johnstone, Director Chemistry and Value Chain Leader, AstraZeneca. An audience poll indicated that about 40% thought that Lean Sigma was pro-innovation, non-one thought that it killed innovation, and about 60% declined to vote many of them having experienced real pushback from their colleagues in R&D. Craig’s suggestion, and the discussion that followed on the whole supported this, was that it was how Lean and Six Sigma were deployed that determined the extent of innovation. Mitali Sharma, Senior Executive, Accenture, suggested that a combination of ‘Lean Innovation’ (simplifying and streamlining) and ‘Open Innovation’ (collaboration externally and engagement internally) were needed to change the Pharmaceutical R&D model and so enable R&D to not only “do the right projects”, but “to do them right”. Keith Russell, Global Director Lean Six Sigma, AstraZeneca, described how ‘Design Thinking” can be applied to innovation as a process. He discussed how this can be used to identify value for customers (internally or externally) to identify needs, in product design and programme design (through definition of requirements, features and strategy), and in programme execution (by focusing on core processes). 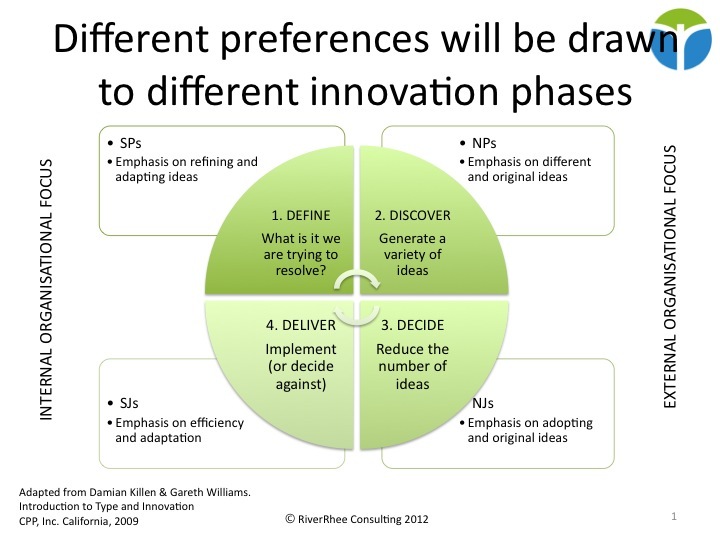 Keith’s approach, which is derived from QFD (Quality Function Deployment) recognises that R&D requires increased as well as decreased variation, and the exploitation of divergent thinking, in a controlled way. The conference ended with Stephen Walker, Director, R&D Continuous Improvement Lead, Pfizer, and Charles Aubrey leading 2 respective focus groups on BPE in Drug Discovery, and in Manufacturing and Engineering. They were useful opportunities to reflect further on points raised during the course of the 2 days.